The first five years of life represent an opportune window to lay the foundations for future good health and well-being. "Physical activity is critical at this time to optimal growth and development. During this time babies and young children undergo rapid and wide ranging physical and psychological developments which lay the foundation for their future health and well being. " Lots of different activities count towards children's daily physical activity. "It will normally include activity that involves moving the trunk and more exertion than the minimal movement required to carry out simple everyday tasks such as washing, bathing and dressing, or activities such as playing board games or passive play (for example, craft activities, drawing, dressing up or playing at a sand table)" , Start Active, Stay Active. Anything where a child is moving around can count – just remember to keep it fun. Top Tip – they don't have to do their 180 minutes all in one go! It can be broken down into smaller bouts of activity, building it up throughout the day. From playing on the floor or splashing in the bath it is important that babies are active from day 1. They need to be able to move around freely and safely, practising important movements such as reaching, grasping for toys, pulling and pushing, turning their heads and playing with people and toys. Time should be limited where they are sedentary for long periods of time, i.e. in a pushchair, highchair. Under 5s that are walking can do lots of fun play to help towards achieving their 180 minutes per day. Playing with balls, doing some gardening, collecting objects such as pebbles and twigs, doing action nursery rhymes, dressing up or blowing bubbles are just a few ideas to keep children moving. Top tip – keep giving lots of praise to boost their confidence and most importantly be active with the children in your care. 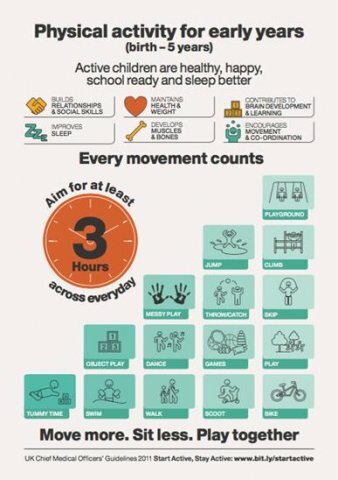 Together with the launch of the UK Early Years Physical Activity Guidelines, the new Early Years Foundation Stage Physical Development Prime area is the main driver that highlights the importance of purposeful physical play that underpins Physical Development. NICE Guidance (2013) recommends that, "Families should be encouraged to eat healthily and be physically active by taking up activities that children enjoy such as active play and dancing, as well as reducing the amount of time spent playing computer games and watching television." Obesity rates are on the rise across England with around 3 in 10 children aged 2 to 15 now classified as either being overweight or obese. In some parts of the country, the NHS has performed weight-loss surgery on obese children as young as 14. The UK now has the highest rate of child obesity in Western Europe which is estimated to be costing the NHS about £4.2 billion a year.